Designed for newborns up to six months old, the BabyBjörn Cradle is a compact, cozy cradle that soothes your baby with soft rocking motions. Parents can rock the cradle themselves or let their baby’s movements gently move the cradle back and forth. With a spring suspension system similar to a stroller, the cradle rocks smoothly in all directions and won’t get stuck in any position. Discontinue use at 18 pounds or when your baby can sit up, kneel, or stand unaided. Add the BabyBjörn Canopy for Cradle (sold separately) to make the cradle even cozier for your infant. The sheer canopy screens and softens ambient light for a comforting atmosphere. The BabyBjörn Fitted Sheet for Cradle is a perfect fit (sold separately). Easily remove the cradle fabric and mattress cover for cleaning. The cradle fabric and waterproof mattress cover are removable and machine washable for easy cleaning. Simply unzip the mesh fabric and wash on gentle cycle. For best results, allow cradle fabric and the mattress cover to air-dry before reassembly. Lightweight design makes it easy to move from room to room. Ideal for those early months when your newborn alternates between short periods of sleep and wakefulness, this lightweight cradle is easy to move anywhere in your home, so you can always keep your baby close. Its durable foot grips keep the cradle steady without damaging your floors. Cradle can be rocked by parents or baby’s own movements. Designed for newborns up to six months old, the BabyBjörn Cradle is a compact, cozy cradle that soothes your baby with soft rocking motions. Parents can rock the cradle themselves or let their baby’s movements gently move the cradle back and forth.With a spring suspension system similar to a stroller, the cradle rocks smoothly in all directions and won’t get stuck in any position. Discontinue use at 18 pounds or when your baby can sit up, kneel, or stand unaided. The BabyBjörn Cradle provides your baby with a safe and comfortable place to sleep anywhere in your home. This cradle comforts your infant with gentle rocking motions and is lightweight enough to be easily moved from room to room. Breathable mesh sides allow generous airflow, while the cradle’s low height lets you check that your child is sleeping safely and peacefully. 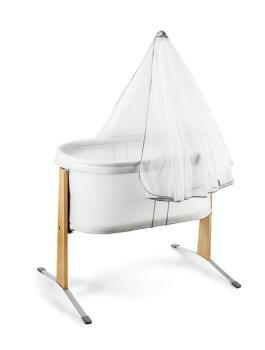 The cradle’s low height and transparent mesh fabric allows you secure supervision of your baby. The cradle is designed with a breathable, soft mesh fabric that provides excellent airflow and lets you keep an eye on your infant. Its low height makes it easy for you to reach in and comfort your baby. And because its sides are constructed entirely from fabric, there are no bars or loose parts. The fabrics are Oeko-Tex Standard 100, class 1 approved, an international safety standard for textiles. All fabrics and materials used in BabyBjörn Cradle are kind to your baby’s delicate skin and completely harmless to taste or chew. The fabrics are Oeko-Tex Standard 100, class 1 approved, an international safety standard for textiles, and contain no health-hazardous substances. The BabyBjörn Cradle meets both European and American safety standards, EN 13209-2:2005 and ASTM F2236.